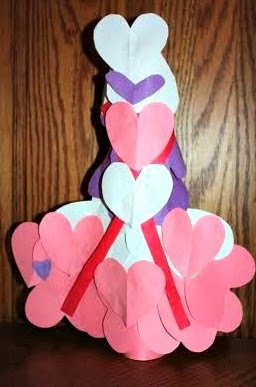 During one of our *bonus* days inside this week, my daughter and I made a pretty Valentine's Day Heart Tree. The tree is actually pretty easy to make and can keep the little ones busy for a nice chunk of time! 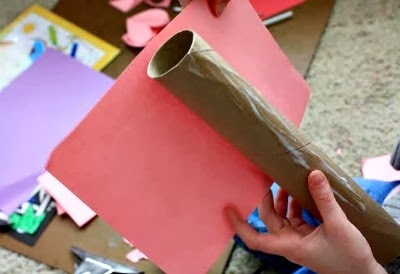 First, cover the paper towel roll with your preferred color of paper. We chose pink. After gluing the paper on, you will need to let it dry a little. 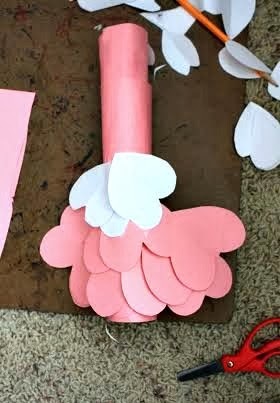 While the paper towel roll is drying, cut out about 35 paper hearts. The number you will need will depend on the size that you choose and how full you would like your tree. The beauty about art is that you can add so much variation! I made a sample heart for my daughter to trace to make cutting them out easier. 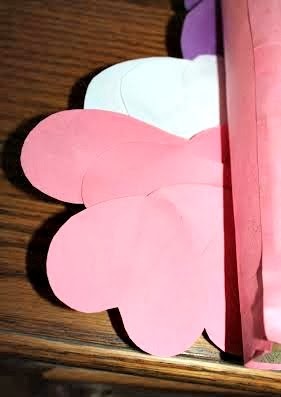 I did help with cutting out the hearts----we have to unleash our inner child some time, right! After we cut the hearts out, we laid the roll down on our art board and laid some of the hearts on it to see how we wanted to layer them on. We glued some to the "trunk" of our tree and then fanned some out by gluing them onto hearts fixed to the trunk. You can add all sorts of embellishments to this if you would like. Pretty easy decor and made from supplies you already have. Plus, it keeps the kids busy! The paper towel roll makes this decoration able to stand up, so no hanging!